[ O! Dweller of Kashmir, o goddess of knowledge and wisdom. I pray you o goddess! Give me knowledge. ] is the psalm of every student of our college, of his/her scholastic life. In the very name of presiding deity of knowledge our college has its existence. Gajanan, the elephant headed god is known as destroyer of all impediments. 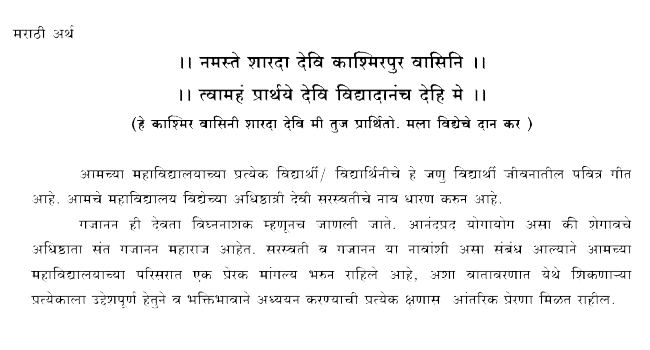 The joyous coincidence is that Gajanan Maharaj is the presiding saint of Shegaon. The very names of Saraswati and Gajanan have made the premises of our college a hallowed place. We are sure the hallowed atmosphere of our college will inspire every student to pursue his/her studies purposefully and with utmost devotion. Sadhana Shikshan Mandal’s, Saraswati College, Shegaon, established in the year 2009 by Mr. Sharad M. Shinde, Secretary, Sadhana Shikshan Mandal, Shegaon, is unaided, non profitable and non minority institution. The college is located in the vicinity of educational hub of Shegaon town comprising of Shri Sant Gajanan Maharaj College of Engineering, Shegaon, Shri. Sant Gajanan Maharaj English Dnyanpeeth and Government ITI. Saraswati College is set in rural quiet and idyllic surrounding. The architecturally designed building of 3171 sq. m. build up area with high quality infrastructure, furniture and equipment make it one the most desired destination for the aspirants of computer and IT studies. This is the only stand-alone institute in the Western Vidarbha area of Buldhana, Akola and Washim districts offering only computer education.